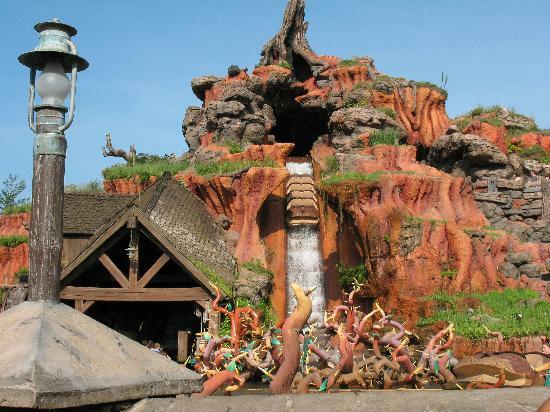 Splash Mountain is a fun ride for the whole family. It only has one big drop (seen above) and then several smaller drops on the inside of the ride. Yes, you may get wet on the ride depending on where you sit. No matter where you sit, you will be taken on the journey of Brer Rabbit as he attempts to elude Brer Fox. Though, he is eventually captured, he finds a way to escape and return home to the Brer Patch. It is a great ride to go on early in the morning while everyone is going to New Fantasyland and/or riding Space Mountain. 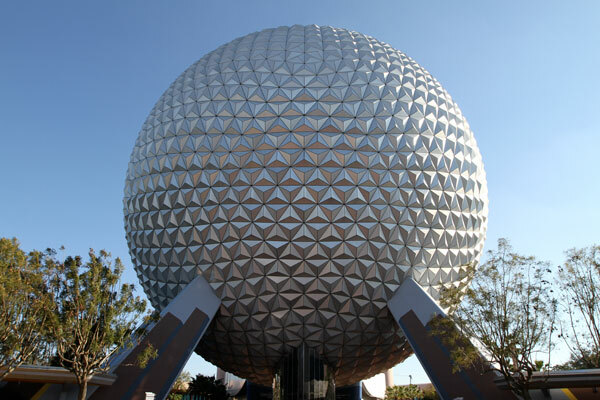 The iconic structure of EPCOT. The building which has an entire attraction inside of it (think about that for a minute or two). The attraction is a leisurely stroll through the history of civilization narrated by Dame Judy Dench. Unlike Splash Mountain, this is an attraction that you want to avoid first thing in the morning. This is an attraction for later in the day as you are leaving the park. The problem is its location as the first attraction people see when arriving at EPCOT. People’s natural tendency is to go ride that attraction and, as a result, it has longer wait times early in the day compared to later in the date. This is an attraction to go on as you are leaving EPCOT for the day. 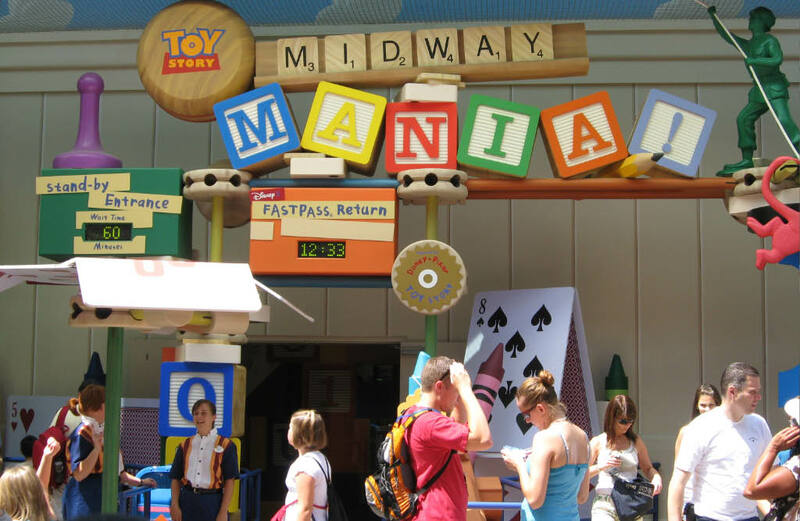 A bit of news: Today (October 6th) Disney is conducting a queue test at Toy Story Midway Mania. There is no stand-by queue. The only way to get on the ride is to have a Fastpass. If a guest does not have a Fastpass Plus reservation, they will not be turned away. They will be given an “old-school” paper Fastpass with a return time. Not sure, how long this test will last. Toy Story Midway Mania is a fun ride for the entire family. It’s vintage carnival games with a Toy Story twist. The whole family can compete at the same time and compare scores and prices. Kids can score as well as the adults because there are high scoring targets at both eye-levels for kids and adults. Kids don’t look at the top of the screen but do look at the bottom of the screen so the Imagineers set up high scoring targets down low as well as up high. It can make a child’s day when they score better at Toy Story Midway Mania than the adults in their group. The queue is fun too with oversized kids games and a Talking Mister Potato Head. This is the only attraction I go on at Animal Kingdom every trip. I’ve gone on some of the Dinoland attractions when my daughter was smaller and I’ve seen the Festival of the Lion King on visits to Animal Kingdom. The only constant, an Animal Kingdom, for every trip has been Kilimanjaro Safaris. It is a great attraction going through the safari and, with the right camera, you can get some great photos (see above). One of my best tips for this attraction, especially if you going for pictures, is to go with a spotter. It is a difficult for one person to look out both sides of the safari vehicle. A spotter can look out the other side and find animals for the photographer to zoom in and get pictures. These are my must-dos in each Disney park. What are your Disney park must-dos? Leave us a message on the Facebook group, on Twitter, or on the post itself. Thanks for reading!